For other characters of the same name, see Harry Balzac or Harry Hall. You may also be looking for Harry Plums Wholesale Fruit or the Harry Gold Parkway. Harry is a character in the Grand Theft Auto series who appears as a minor character in Grand Theft Auto: Vice City (set in 1986). He is a member of the Forelli Family and known associate of Don Sonny Forelli. He is not voiced during his only appearance. Harry at an unknown time joined the Forelli Family and, by 1986, had earned the trust of Don Sonny Forelli. In 1986 Sonny sent Harry, Lee and the recently paroled Tommy Vercetti to Vice City in an attempt to expand the family's operations into the drugs trade. The three are met at Escobar International Airport by their only contact in the city, lawyer Ken Rosenberg, who drives them to Viceport where they're scheduled to meet Victor and Lance Vance to purchase drugs. Shortly after the deal is done, Ricardo Diaz' men ambush the deal, killing Harry, Lee and Victor Vance. 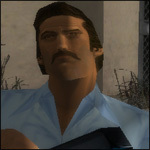 Vercetti later informs Sonny of the deaths of Harry and Lee, although Sonny is more angry at the loss of money than either of the deaths. This page was last modified on 22 January 2014, at 00:05.